Wow! 2013 is coming to an end and what a year it has been for me, my friends, family, clients, and others I work with in the corporate world. This year has been full of much change both good and bad for many. Can anyone else out there relate? I know I can. With most any kind of change there is stress, uncertainty, and sometimes nervousness, fear, or even frustration. How does one navigate times of change? I will give you 4 steps that I use for myself and my coaching clients. 1. First, you should assess the change and how it relates to you and your situation. Instead of being hesitant about the change, think about the positives the change may bring to your life. It may not be as scary as you think and may present opportunities you hadn’t considered before. 2. Next, let go of what was or let go of the past. According to William Bridges, an expert in managing change; people have to accept that something is ending before they can begin to accept anything new. You must let go of a part of the way things used to be in order to move forward. Acknowledge the loss of what was, accept it and move forward. It may take some time to let go but it is important to not get stuck there. Also remember that change is a process, not an event. 3. Accept and embrace the change because whether the change is good or bad, it gives you a great opportunity to learn and grow. Life is not about what happens to us but how we handle the things that happen. What positives can you make of the new situation? 4. Use the change to push you forward and build upward momentum, not set you back. Regroup and create a plan that will move you to the next step in your life. It is important to look for the good in every situation and trust me, there is some positive there somewhere, you just have to find it. Stay positive and don’t look back. Make a habit of finding the good in every situation. I promise you won’t regret it. 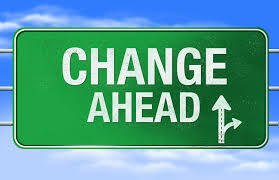 Embracing and appropriately handling change is one of the characteristics required to live the life of your dreams. Our happiness is 10% about our circumstance and 90% about our attitude and approach in life. Focus on what you can control and do in your life; not what you can’t. If you have experienced a lot of change in your life and are not sure how to handle it, a coach might be a good resource to consider helping you get unstuck. Feel free to visit my website at www.dreamlivingcoach.com to learn more about my coaching services or reach out to me with any inquires at dreamlivingcoach@gmail.com. I will also soon have a Dream Living Journal available, which is a great tool to help you get on track to living the life of your dreams.